During a visit to the State Enterprise "Antonov" head of the Kyiv city state administration Alexander Popov showed its own development engineers, the company — integrated simulator of the An-148 passes MFN. "This unit was put into operation in May last year. Level D flight simulators of the An-148 has been completely designed and built by experts" Antonov "and became the first post-Soviet space simulator such a high level," — said after the demonstration of general designer Dmitry Enterprise Kiva. According to him, with the help of the device can fully simulate the situations that occur in flight, which will significantly increase the level of crew training and, consequently, the level of safety. Also, Mr. Kiva noted that the focus of the flight personnel "Antonov" has already trained more than 200 pilots for the An-148. 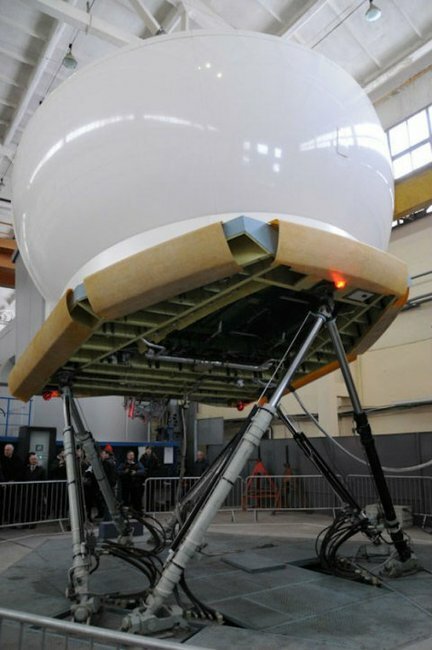 "The simulator has a six-speed dynamic stand and a collimated visualization system, which allows a nearly 100% of the sensation of flying," — told the newspaper Khreschatyk chief of experimental research Alexei Kurgan. — "In our factory, there are two such simulator, and we can provide pilot training for 60 aircraft. For the novice pilot before getting behind the wheel of the aircraft, will take about 48 hours of practice in a simulator." Chairman of the Kyiv City State Administration Oleksandr Popov personally acquainted with the work of the simulator. During the visit of KSCA management has examined the production capacity of the plant. As the president and general designer Dmitry Kiva Company, today the plant is actively growing: takes a lot of planes, new models. "We have signed an agreement with Russia on joint development continued and the subsequent serial production of the An-70," — said Mr. Kiva. In addition to international programs with Russia, India and Kazakhstan, the plant is working to develop aircraft for the Ukrainian military, but the lack of funds hampers the production. "Unfortunately, the state budget is not very much money to do something for the Air Force of Ukraine, — says Kiva. — But there is a question, and the program proposed in the budget for this year. Therefore, for the first aircraft, which we produce, already made the fuselage. We will plan to finish two of these aircraft in 2013. " "You are a model for the rest of the industry and the Ukraine. Your high-tech products is recognized worldwide. We are proud to work," Antonov ", we are proud that this capital company," — said Alexander Popov, referring to the employees of the plant. Head of Kyiv City State Administration has noted that the strategic challenge that metropolitan authority has set itself with the people of Kiev — is to support the urban producer. Mark of Quality "Made in Kiev" has every reason to become a recognized and respected throughout the world. A state-owned enterprise "Antonov" is an example of a high level of quality of production and social protection. Today, more than six thousand aircraft type "AN" ply in different parts of the world. Over their manufacturer in Kyiv has 13,000 plant specialists "Antonov". Despite technological advances, the company is still unresolved housing problem. It is about the transfer of the balance of 20 high-rise buildings of the plant. During a visit to the company head KSCA Alexander Popov promised to do everything to facilitate the development of institutions and help address the housing problem, writes "Khreschatyk". The plant management "Antonov" asks the capital to take on the balance of 15 apartment buildings, which the company has built for its employees, 2 villas for accommodation for young workers, 3 hostels and 9 playgrounds. These 20 buildings are more than 5,000 people. Chairman of the Kyiv City State Administration Oleksandr Popov has supported the initiative "Antonovites" and promised that after the decision of the legal issues surrounding the building and the utility grid will be served by city services. "Well, in Kiev there are companies that care about solving the housing problem of their employees. City authorities should encourage the realization of these aspirations, and solve complex problems," — said the head of the city administration. In addition, Alexander Popov promised to help with the construction of new housing for the collective enterprise. "The purpose of my visit — is to provide the help that is available from the municipality in terms of, first of all, the construction of housing, — said the head of the KSCA. — We will help the plant, allocating land and solving the problems of the further operation of housing. Now with the district government administrations worked through the mechanism of allocation of such land. town will be able to participate in the building at the expense of capital investment, which provides state and municipality allocates for affordable housing program 70h30 and 50×50 ".